The striking new design will be seen on Irish shelves from January 2016, with the redesigned Stolichnaya® Flavored Premium vodka range to follow later this year. A slightly taller and more elegant bottle shape that improves both pouring and control for bartenders, with the use of anti-slip embossing on the neck. A revised front and back label, highlighting Stolichnaya’s use of Certified Alpha Grade spirit – the highest quality level a spirit can reach. 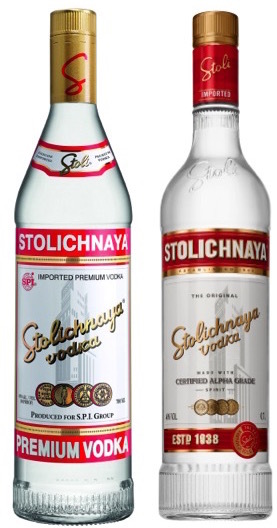 A new, ‘craft’ label texture, refined medals and a beautiful, bold upgrade of the main STOLICHNAYA® logo. “The Stolichnaya bottle has been iconic for several generations, and now it’s the time for Stoli – as it is affectionately known – to make a new bold statement in claiming its position as THE Vodka.” comments Rob Cullins, CEO Stoli Group. ‘THE Vodka’ is a tagline celebrated by Stoli® as a brand that has pioneered the vodka category since its inception. Stolichnaya® was the original premium imported vodka in the United States, the first vodka brand in space, the first brand to launch flavoured vodkas in the 1960s and has been enjoyed by party-goers the world over, ever since. While its bottle has changed, the vodka remains the same. Three times distilled Alpha grade spirit, blended with artesian well water and four times filtered – the award winning liquid serves as the benchmark for premium vodka. Stoli Group (headquartered in Luxembourg) was established in 2013 as the division that is responsible for the production, management and distribution of SPI Group’s global spirit portfolio – the iconic Stolichnaya® Premium vodka range, elit™ by Stolichnaya® and Moskovskaya®. With operational business units across 3 continents and distribution in 167 countries, the group is led by a multi-national management team with key office locations in Europe, USA and China. With almost 1 bottle of Stolichnaya® Premium vodka sold every second, each one defines the benchmark for quality with a meticulously crafted liquid that meets the highest alcohol standards – Alpha Spirit. Stoli’s exceptional purity is achieved by controlling the process from grain to bottle, using only the highest quality ingredients and processes in the Group’s own, ultra-modern raw alcohol distillery in Tambov. The spirit then travels to Latvijas Balzams where it is blended with artesian water, quadruple filtered and bottled to become Stolcihnaya® – as it has since 1938.